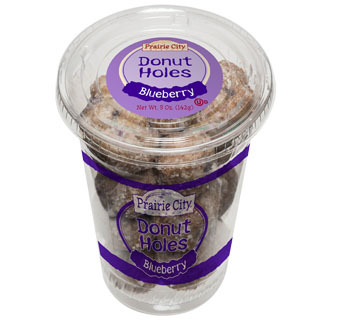 Bite-sized donut holes are the ultimate in breakfast-to-go items and Prairie City Bakery brings you the best in breakfast and to-go items! Our Donut Cups give the grab-n-go customer a fun, easy way to enjoy them. What can we say about Blueberry except when added to our delicious donut hole recipe will make any blueberry lover say Mmmmm. Tender, tasty bite-sized donut holes are each coated with a rich glaze and packed with giant flavor. Each cup contains a generous 5 oz. serving and is merchandised for a quick sale. Four delicious donut flavors available: Old Fashioned, Blueberry, Cherry and Chocolate. Ask about our cool Donut Hole To-Go merchandising display—you won’t find another one out there like it!